This week, it’s more summer fruit action for TWD, as Michelle from Michelle in Colorado Springs has selected Dorie’s recipe for Summer Fruit Galette. I’m wondering if there are any Southern Hemisphere dwellers coming up in the rotation? Anyone to pick a heavy, wintertime bread pudding, or perhaps a little pumpkin somethin’ somethin’? Just kidding…actually, I have something up my sleeve, and it’s one of my absolute favorites. It’s no secret either, because I used it last week— rhubarb. I so associate rhubarb with spring back in the States, but I mentioned last week that I see it at the farmers’ markets year-round here. Maybe it’s the mild climate or something, I dunno. And I’m talking about thin, red as anything, beautiful stalks, with healthy green leaves (although they’re not healthy to eat–call Mr. Yuck!) still attached. It’s really a veggie, by the way, so perhaps I should call this a “summer vegetable galette”? A galette is a free-form tart. Less muss and fuss than one baked in a ring, it’s easy to make, and even easier when you have enough of Dorie’s pie dough (left over from my mini Double-Crusted Blueberry Pie) stashed in the freezer to do it. I made two individual-sized galettes. After cutting out the rolled dough into two circles, I smeared the centers with a little strawberry rhubarb jam and sprinkled on some almond cookie crumbs. Then I just piled on a heap of cut rhubarb. Because I really liked the bite of ginger in last week’s cobbler, I chopped up a couple of small hunks of baby stem ginger in syrup that I had in the fridge, and dotted it among the rhubarb pieces…it’s pretty potent stuff, so a little goes along way. I folded the edges of the dough up to form pleats, and the galettes looked oddly similar to a stop sign when viewed from above. I wouldn’t exactly say that rhubarb abounds in natural sweetness, so when I sprinkled the dough with raw sugar before putting the galettes in the oven, I also sprinkled some on the rhubarb. A few minutes before the galette finishes baking, a “custard” of melted butter, egg, sugar and vanilla gets poured on top. I had initially thought about leaving it out, because the combination of ingredients sounded a little weird to me, frankly. Other TWDers said it really added something, though, so I went ahead with it. And I must say, while it had a strange color (some may say “snot-like”), it was quite tasty and it gave a nice sweetness that seeped all around the rhubarb to fill in the gaps. To serve, I followed Dorie’s suggestion to simply dust some powdered sugar on top and call it day. We really enjoyed this. It’s a great simple dessert, and I’ll definitely have to try it with some stonefruit in another six months! And I have to say (even though I should not praise that which contains shortening), Dorie’s pie dough is super freakin’ flaky. Look in Baking: From My Home to Yours by Dorie Greenspan or read Michelle’s post to find the recipe. Don’t forget to check out the TWD Blogroll to see what over 200 other people had to say! P.S. : So sorry, but I may not be able to make the TWD rounds myself for the next couple weeks. I’ll be on vacation when you read this–twelve days in America’s paradise, and without our laptop. Aloha! Enjoy your vacation! Great looking galette! Your galette looks fabulous. Gorgeous coloured rhubarb! Great job! The rhubarb sounds yummy here. Hope you’re having fun over there under the sun! Aloha!! Lucky duck! Your galette looks insanely good! Great job as always! First of all, have a WONDERFUL vacation! Hawaii is amazing. And your galettes are lovely. Glad you enjoyed it! Again, have fun! I love the picture of the rhubarb. Enjoy your vacation! Mmmm, yummy! Yours looks positively delish! So nicely photographed too. I’ve been dying to see what others’ galettes looked like. you must try this recipe with stone fruit. and i so agree with you that the pie recipe is super flaky! love it to bits! enjoy your trip in America! Hawaii i believe? Your galette looks really good! I love the sound of adding stem ginger. I wasn’t sure about the custard either, but I agree it was a nice addition. Even while living in the northern hemisphere, I’m thinking something non-fruit would be fabulous, so I’m right there with you. 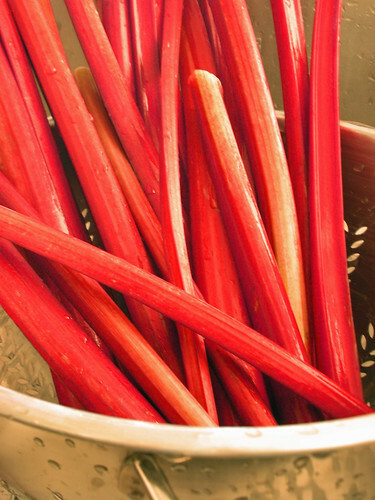 Rhubarb sounds like a wonderful save though, and they look adorably delicious. Wonderful. Your pictures are so pretty. I love the blue backdrop against the galette. Great job, the ginger with the rhubarb sounds heavenly. Nice galette. Your crust looks luscious! Your gallete looks great! I think rhubarb would taste really good. Great stuff! Enjoy your long vacation! Loved your description of the ‘custard’ 😉 Enjoy your vacation!!! LOL – “…a little pumpkin somethin’ somethin'”!! That’s great!! The galette looks wonderful!! It looks so delicious! Great photos! Your galette looks so perfect, and I love that photo of the rhubarb stalks. They are so red and colorful! Adding ginger to the compote sounds delicious. Have a great vacation! Hahaha snot like?!! I love it! Snot or no snot, your galette is gorgeous! Enjoy your vacation. Recipe is amazing! Looks delicious. Have fun on vacation! Looks fantastic and I don’t even like Rhubard! Enjoy your vacation! Your pictures are beautiful and your galette looks delicious! Hope your vacation is fabulous, your rhubarb galette looks wonderful! I love rhubarb. So jealous that you have it available all year round. Your galette looks delish! Hi, Just stumbled upon your blog from the foodie blogroll. It is beautiful! Your pictures are delicious -I’m getting hungry! Everything looks very nice and very tasty. Didn’t get a chance to see your old template but I love your new one. Your tart looks gorgeous – so perfectly “bronzed” on the sides! Mine came out pale even though it was fully baked. I’m guessing maybe you brushed it with egg & sugar?? I’ll need to try that next time. Mmmm. Rhubarb! I love rhubarb! Yummy galette! yum! Looks delicious! Great job! it looks fabulous!! rhubarb two weeks in a row! Your photography is beyond gorgeous!!! I mentioned this to my 25yr.old son (computer+++) and after what seemed like 100 different clicks, identified your camera, bought it on Amazon and is still thanking me for showing off your pics. (Of course, I do think YOU have something to do with your beautiful presentations. . . you are extrememly talented and definately inspirational. That’s a lovely galette! Dorie’s piecrust is super-good, isn’t it? 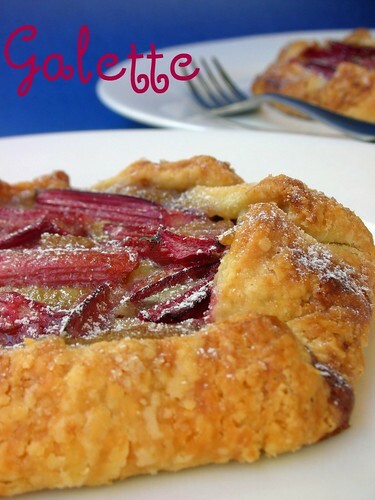 your rhubarb galette looks great!